It is safe to say that Reed Heintzkill lived a full life before he became a student at the University of Wisconsin-Green Bay. And, it appears he has made the most out of every single moment, since. Heintzkill will receive the prestigious Paul and Thea Sager Scholarship for excellence in scientific writing at the 27th annual Cofrin Student Symposium, from 2 to 4 p.m. Tuesday, March 1 in the Christie Theatre, UWGB. The chemistry major will graduate in May 2016 with honors, and with the utmost respect of hundreds of campus community members he has come in contact with at UWGB. His list of involvement at UWGB is extensive: an active member of the Segregated University Fee Allocation Committee (serving as member, vice chair, and chair in past years), current member of Student Senate; summers spent with the student group Enactus and Economics Prof. John Stoll, performing interviews for the American Federation of Counseling Services’ annual Ethics in Business Awards; and budgeting assistance to a number of student organizations and charitable groups including PEAC, Campus Kitchens, Round River Alliance and Healthy Fork. 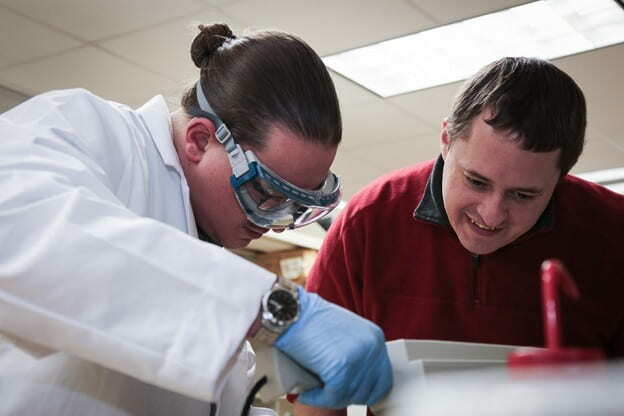 He volunteered to work with UWGB students in discussion sessions of Chemistry 1 and 2; and similarly at NWTC for two semesters — leading two or three one-hour blocks of 20 to 30 students each week through their Chemistry discussion sessions. For his efforts he was honored wit the University Leadership Award in Spring of 2015. He received the award for his laboratory report, “Characterization of poly(3-hexylthiophene)(P3HT) through UV-Vis absorbance and experimental HOMO/LUMO energy level determination” — a final requirement for Asst. Prof. Jeremy Intemann’s Instrumental Analysis course. The assignment allowed Heintzkill to hone his skills in scientific writing while gaining a better understanding of the electronic properties of polymers used in organic photovoltaic cells. 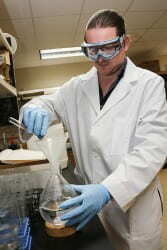 He hopes to continue his research on organic photovoltaics in graduate school at UW-Milwaukee next year. “We are synthesizing a small molecule that Prof. Intemann has proposed may have desirable qualities for use in photovoltaic cells (solar cells). While this particular molecule has never been synthesized before, Dr. Intemann has made similar molecules, with slight variation on some of the functional groups attached to the main body of the molecule. The paper I wrote for the scholarship was for another material altogether, a polymer called P3HT, which is widely known and studied, but our current research is very closely related to the subjects covered in my lab report. His parents, Megan and Mark Heintzkill, say his curiosity and thirst for knowledge has been apparent from the beginning. When the recession hit in 2008, the St. Thomas office shut down, and at 27 years old, he gave continuing education a second thought. “I’d always had an inquisitive mind but never felt college was necessary until I hit the ceiling of what a smart but woefully uneducated lad could do,” Reed said. He moved back to his family (in Green Bay) completed his GED and general education requirements at NWTC and transferred to UWGB. UWGB gave me an opportunity that had previously passed me by and allowed me to get on track to utilize my potential,” says Reed. “So we’ve got the story of someone who had thought that school was a foregone option, who ended up succeeding — there’s a lesson that it’s never too late to chase your dreams. Something that’s occurred to me on more than one occasion has been how appropriate the UWGB setting is for me as opposed to a larger state school…I think at a bigger school I would have been lost in the shuffle. With the small class sizes here, I’m able to create good relationships with instructors who have been very willing to give me the help I need to succeed. An added bonus, his parents are relieved, and quite proud. Megan said that the individuals Reed encountered at UWGB changed his life. The public is invited to attend the 27th annual Cofrin Student Symposium on Tuesday, March 1. Four students will present their research as well. More on the Symposium is available on the Cofrin Center for Biodiversity website. This entry was posted in News and tagged Natural and Applied Sciences on February 25, 2016 by Sue Bodilly.